More than 300 people turn out for late hearing on Mollison school closing on February 8... Alderman, dozens of others denounce CPS attacks on Mollison, Wells Prep. One of the largest turnouts for a hearing in the current cycle of hearings on school closings, turnarounds, phase outs, and consolidations took place on the night of February 8, 2010, when approximately 300 people showed up to oppose the closing of Mollison Elementary School and the consolidation of Mollison and "Wells Prep" into the Mollison building. 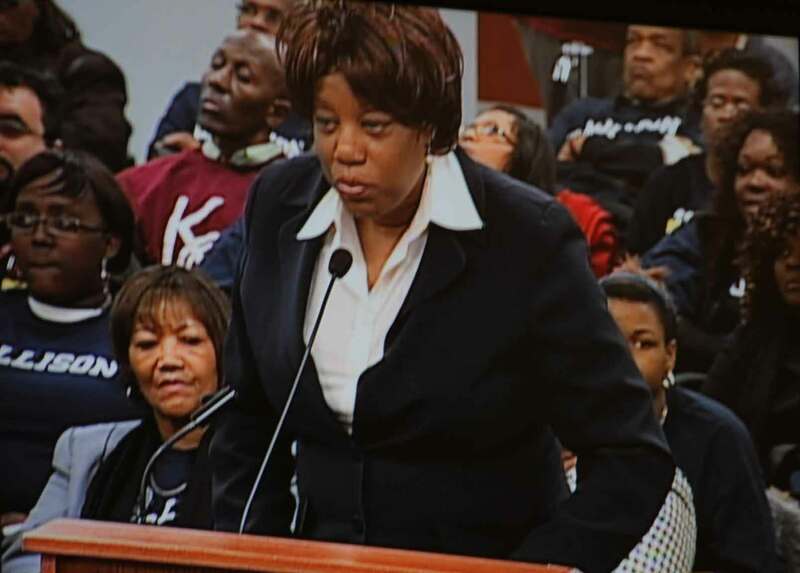 In full support of Mollison Elementary school on February 8, 2010 at the City of Chicago Board of Education chambers, the Grand Boulevard Federation — in a second time testifying against any school changes in the area — challenged the Board’s data and motives to dismantle existing elementary schools that are serving the neighborhoods they serve. The first testimony by Grand Boulevard was on January 29, 2010, in opposition to the McCorkle Elementary Consolidation Hearing. The biggest concern was that all the testimony the Board and its agents put into the record including data to justify the actions against these schools was that the data did not truly support any of the CPS criterion for changing these schools. A little over one week later, on February 8, 2010, Andrea Lee of the Grand Boulevard Federation was back at the Board, challenging the Board's plan to close Mollison Elementary School, move Wells Prep into the Mollison building, and then create "Wells Prep" at Mollison. In both cases, the schools that were slated to be dismantled and put into another school were actually doing well on standardized tests, according to those who testified for the community, and showing growth — despite what the Board administrators testified to on the record. What was put into the record by school staff, administrators, students and community members was that Mollison either received less than needed resources or had resources taken away. In one dramatic instance, the school's staff pointed out that a few years ago, CPS central administrators made an error in estimating the school's needs and ordered the cut of three teachers at the beginning of the school year, supposedly because of "declining enrollment." There had been no decline, but the teachers were lost to the school forever. Some called it sabotage, year after year after year. In both cases (McCorkle and Mollison) it was revealed that CPS in 2010 had sent staff and moving carts to start clearing out the buildings before the hearings even took place. Teachers at Mollison on February 8 noted that the building has received moving boxes for the teachers to pack their materials — while their student watch and the school year faces several months of intense activity, including the all-important ISAT (Illinois Standards Achievement Tests) testing time. Teachers, parents and community leaders during the Mollison hearing charged that that these activities were being made to accommodate the Academy for Urban School Leadership (AUSL). AUSL is a private "turnaround" contractor. CPS Chief Executive Officer Ron Huberman has proposed that AUSL be given a "turnaround" contract to turn around Phillips High School, which presently houses "Wells Prep." Community activists charge that all of the activity is to give AUSL a “well conditioned” facility — without Wells Prep or the Department of School Security and Safety (which has already been moved out of the Phillips High School building). Gentrification is also on the agenda, according to many. Another interesting fact that seems to be the theme from community members and parents testifying at all the hearings this year is the changes in the surrounding neighborhoods that have seen thousand of housing projects units removed and replaced with new condominium projects and townhomes. "CPS announced that it will consolidate Irvin C. Mollison School due to chronic underperformance," said Andrea Lee of the Grand Boulevard Federation. "The truth is CPS’ proposed consolidation does not require Mollison to close and consolidate as it appears in CPS’ announcement. CPS’ attempt to circumvent the truth to the public actually entails a closing and consolidation of Wells Prep school where the students, administration, and staff are to be relocated to Mollison. It will replace the Mollison staff and administration due to so-called chronic underperformance." However, the Mollison staff, parents, and community are sharing the truth about Mollison students learning and progressing. “The truth is, since 2003, Mollison has made significant 20 percent gains on our ISAT tests, and we are now at 54 percent,” says Mollison teacher, Laura Meili. — Wells Prep is a high scoring school where by closing and moving it would violate CPS’ new school closing guidelines. — By saying Mollison is under-performing, it gives CPS the right to fire all of the staff and administration at Mollison, thereby allowing a deal to be had where Wells Prep staff and administration may take over Mollison and attention does not get drawn to Wells Prep as the real school closing. Since CPS is masking the real school closing and move, Wells Prep doesn’t even get proper recourse during this process. Wells Prep scored 71% on the ISAT, a 29% gain from 2003 to 2009. Wells Prep really seems to be the school that is marked for closure and relocation. In addition, CPS proposed a name change (i.e. Wells Prep - Mollison, or a new one altogether), even more proof that Wells Prep is being closed, and yet Mollison is being blamed. Gained 20% points on our ISAT’s since 2003, where we are at 54.2%. The Performance Policy, which was passed this past December does not accurately reflect our learning; 74 schools are lower-performing than us and some of these school include those with good test scores. Fourteen schools in Area 13 are lower performing than Mollison, and 12 in Bronzeville are lower performing. For the past 3 years, Mollison outscored Area 13 averages on the ISAT, and the other two years, Mollison’s scores still increased. Mollison is not poorly performing enough to receive State SES funds, but yet CPS can create its own policy and deem Mollison chronically low performing. Mollison is a model “Calm” school already. Why create safety concerns by moving students from other neighborhoods to Mollison? This year, suspensions are at 6, compared to last year’s 151. This year, there have been zero expulsions, compared to 5 last year. It seems that CPS is actually closing and moving Wells Prep since Wells Prep staff and administration will replace the staff at Mollison and become responsible for Mollison’s budget and building, with a new name and new Mollison attendance boundaries. GBF believes Mollison happens to be the chosen victim of a larger facilities plan to move Wells Prep students from its current location of sharing a building with Phillips High School. CPS has manipulated its school closing communications where CPS is not consolidating Mollison in the way it typically announces school consolidations, and that Wells Prep should have been the school named as one proposed to close and consolidate. • Wells Prep shares a school inside of Phillips High School. CPS announced in January 2010 a proposal to hire the Academy for Urban School Leadership to “turnaround” Phillips High School. Was CPS trying to prevent the public from questioning why Wells Prep must be moved, were it to named Wells Prep more accurately on the list? Wells Prep scored 71% on the ISAT, a 29% gain from 2003 to 2009. By closing Wells Prep and moving them to Mollison under a proposed new name with new attendance area boundaries, this appears like a school closing and consolidation. However, by CPS masking the real intentions, it hides the larger truth of CPS actually proposing a school closing and consolidation that would conflict with its newly passed Student Bill of Rights and school closing guidelines (12/2009). In addition, CPS states that on average, only 50% of the students relocate during a consolidation, so why push out Mollison administration and staff who were are a good job educating our children in order to make room for only 50% of the Wells Prep student body with their entire staff and administration? By CPS sweetening the deal where the Wells Prep staff and administration are proposed to takeover Mollison, it creates incentive for the Wells Prep school and community to not raise this as closing and it creates incentive to not publicly question the future of Wells Prep and its integrity as a high performing, small school, both reasons for which could prompt community questions about CPS real intentions. CPS has not given a clear explanation as to why Wells Prep needs to be moved out of Phillips and into Mollison. CPS needs to provide the community with the reasons why Wells Prep cannot remain at Phillips. CPS has not been very transparent in its intentions about the school closings/consolidations and not fair or accurate in its accusations defaming Mollison as chronically low-performing. Since it is clear that Mollison is not chronically low-performing and is actually doing what the District wants to see in an improving school, the CPS proposed Mollison consolidation and administrative takeover by Wells Prep should not even be an option. It seems that both Mollison and Wells Prep are victims of CPS’ larger plan that the community remains in the dark over. GBF asks that you not act on CPS’ proposal for Mollison and Wells Prep, and CPS should not close or move or consolidate either school. We alternatively request that CPS work with the school and community on identifying educational and facility needs more comprehensively, transparently, and with greater fiscal accountability for all of Bronzeville. GBF believes that a longer-term educational and facility plan for both Wells Prep and Mollison students be addressed with greater school and community involvement. The need for school buildings should not become a vehicle to push or hurt students who are learning, as in this instance where both schools have shown proven progress in teaching and educating our children in spite of changing community demographics and decreased funding for education. In closing, given Mollison’s past five years under Principal Wilhelmena Kenan and her dedicated staff, GBF expects to see continued learning and progress at Mollison. In turn, we believe families that have replaced those displaced from our community will enroll, and that Mollison will become a model, walkable, neighborhood school of “choice” for existing families that have remained in the neighborhood and for new families in the near future. GBF is committed to working with Mollison after it remains open, and we expect Mollison will continue to successfully educate students, and serve families and our larger Bronzeville community. The Bottom Line is that both Mollison and Wells Prep are victims of CPS’ larger plan that we don’t know about. The Mollison family asks that CPS not close or move either school and instead expose the CPS’ foul play. CPS’ proposal is a half-truth, and Mollison’s progress and victimization is the real truth! Third Ward Alderman Pat Dowell (above at microphone) was part of a group of more than 300 people who stayed at the Chicago Board of Education until after 10:00 p.m. on February 8 to speak out in opposition to the proposal to close Mollison Elementary School and put Wells Prep into the Mollison building. Substance photo by George N. Schmidt.The following is the testimony of Alderwoman Pat Dowell of the 32nd Ward, February 8, 2010 at the Board of Education, in support of Mollison Elementary School staff, administration, students and community members to stop any consolidation with Wells Prep Academy in which the staff of Mollison would be displaced by Wells Prep teachers even tough scores at Wells Prep are lower than at Mollison. Citing “chronic low performance” at Mollison Elementary School, a proposal to move the students and staff from Wells Preparatory to the Mollison building is being considered. There are many reasons why the term “chronic low performance” is not an accurate description of Mollison. The term is certainly more applicable to several other schools in the area and the city. In the immediate area there are at least five other schools that have lower performance policy scores and six with lower ISAT scores. CPS has also stated that “Mollison has underperformed the district for over a decade”, which is true, but just spending a few minutes on the Illinois State Board of Education’s State Report Card site, reveals there several other schools that have been significantly worse. Considering this, it is difficult to believe that Mollison was targeted for academic reasons alone. 2008-09 was an aberration year for Mollison and CPS bears substantial responsibly for putting Mollison in this position. Inaccurate enrollment figures caused them to release two teachers. In addition to losing their reading coach, they were left short-handed when the projected decrease in students did not occur. Their application to become a “Track E” school has also been denied twice. Despite these and other setbacks, Mollison’s ISAT scores have risen 20 points in the last six years. This year they were able to bring in new nationally certified teachers and staff, including an innovative math teacher. Additionally, Principal Kenan and the dedicated teachers there have been volunteering after school and on weekends to provide tutoring. The Mollison staff has also created a very effective “culture of calm”. Last year suspensions decreased from 151 to IS. Misconduct reports decreased form 150 to 5. No fights occurred and no calls to the police were made. I wish this level of school safety existed at all CPS schools. Bringing in a new staff and students would be a tremendous disruption to the atmosphere of safety the current administration has worked so hard to create. CPS believes that the administration at Wells is better able to help Mollison students meet state standards. While Wells is indeed a good school, comparing it to Mollison is another example of an apples to oranges evaluation. Wells is a small school that has about half the number of students Mollison has and utilizes a city wide enrollment policy while Mollison is a neighborhood school. The movement of Wells would result in another loss of a good school near the State Street corridor where hundreds of families will be moving as a result of the CHA’s redevelopment plans. If Wells were made into a neighborhood school, it would provide another quality option for our incoming families. The recent success that Mollison has had despite their setbacks and the valid concerns with bringing in a new administration from a completely different type of school indicates that the staff~~ students at Mollison are better prepared to make the necessary changes and improvements at their school. I believe this consolidation should be placed on hold in order for Mollison to demonstrate their abilities to continue making improvements and allow ample consideration of long-term community needs, specifically regarding new developments. I know that if CPS makes the appropriate investment in Mollison, these improvements will follow. KEEP ON SITTIN’, LEAVE MOLLISON ALONE!! WHAT DO WE WANT? OFF THE LIST! WHEN DO WE WANT IT! NOW!! WHAT DO WE WANT? REAL SUPPORT! BEST SONG I'VE SEEN IN AWHILE!!!!!!!!! !